Postal chess is one form of correspondence chess. This is chess that is not played in real time, but over an extended period between two distant parties. Someone in the United States can play a game of chess against someone in Australia for example. Basically two people agree on time limits for each move in a game. This could be anything from 3 days to maybe a month. The player playing as White records a move on a specially designed postcard. He then sends his opponent the postcard who records his reply before sending the postcard back. This continues until the game reaches it's conclusion. Postal chess has been in existence for centuries. Some prominent OTB players dipped their toes into the world of correspondence chess. In the early 20th Century people like Paul Keres and Alexander Alekhine, who both had something to say in chess quotes, played in an effort to play stronger opponents that were difficult to source locally. Games and competitions are organized by the International Correspondence Chess Federation or one of it's subordinate national and regional organizations. These bodies have their own arbiters to settle disputes or contentions that may arise. When two players are drawn to play each other, they send back and forth the moves recorded on the postcard as previously described. This format allows a number of days or weeks to make a move. So mistakes or blunders are much fewer than in OTB competition. When a player receives his opponent's move on the postcard he can sit down with his chess board or chess program and take an analytical look at several possible lines before recording his move on the postcard. This means a higher standard of play than similar strength players playing OTB, who have to analyze in their minds eye before making a decision at the board. Computers took off in a big way in the second half of the 20th Century. Chess programs began to emerge along with programs for just about every human activity. With the birth of the Internet it's now possible to play correspondence chess by email or on a chess server. New phenomena have emerged along with the technology. Chess databases and chess engines that continue to grow stronger have entered the mix. Different organizations within the ICCF decide to what extent players can avail of computer aid for their games. There has been some concern that players may end up playing against a computer engine rather than a human opponent. In many cases the use of chess engines has been prohibited. The obvious difference between Correspondence Chess and Over the Board Chess is that when you play over the board you must do your calculations in your mind's eye. You have a clock running down and you must complete the game in the time allowed. There is no such thing as playing out all possible scenarios before choosing what you believe to be the optimum move. There is no luxury of days on end before making a decision. When you play Over the Board, you play one game at a time, as these games are played in real time. Correspondence Chess games, whether played through the mail or on a server, can be played in batches. Players can have more than a hundred games going at a time. For many centuries, chess players played opponents in different parts of the world simply by sending their moves through the post. It would be a long time before it would be challenged as the main form or even the only form of Correspondence Chess. We live in a different age now with many hi-tech forms of communications and Postal Chess is no longer the only, or even the most user-friendly way of playing long distance. Many people still play chess through the post however. The rustic feel of doing things the old way evokes a pleasant nostalgia. It was knocked off the top spot in the Correspondence Chess world by the emergence of a more sophisticated communications platform. This new platform brought many profound changes to our game of chess besides the nature of correspondence chess. This new platform was the computer, bringing us into the age of Computer Chess. 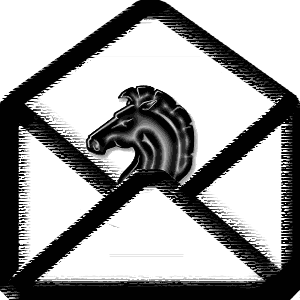 This link takes you from Postal Chess back to your Homepage. Your Homepage is where you get a site overview. There you can see all of the resources on offer in this web site. Take in the long and interesting history of chess. Right from it's origin to the present day.